Kid N Ewe fiber festival in Boerne, Day Two. What a blast. The doors opened at 9 AM and from that moment, the fun never slowed down. Deedee, the new spinner, filled her drop spindle twice and then proceeded to ply both balls together for her very first hand spun yarn ever. We were all so proud - but none prouder than she was of herself. You rock the house, my friend. And speaking of shareholders, we are delighted to welcome three new shareholders and one returning shareholder to the farm family - howdy friends! We taught lots of new spinners today as well. Our "Learn to Spin" kits flew off the shelves and our spinning lesson chair was never empty long. 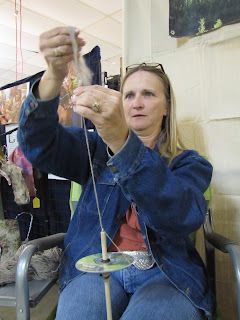 Here's Mary holding her mouth just right to get that fiber turned into lovely yarn. Mary caught on very quickly! Cathy was also a very quick study. 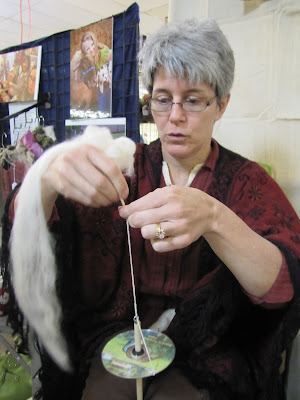 The roving behaved very well under her beginner's hands, and before she knew it, she was making really nice, consistent yarn. Little six-year-old Nellie sang an original song to me while she learned to spin. "Dancing in the sky, singing out loud, whoooooaaa, yeah!" went her happy tune. And she made some mighty pretty yarn at the same time. Helene is also a new spinner and shareholder. 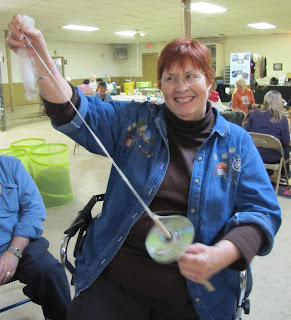 She took home some nice beginner yarn and the satisfied determination to continue the great work she started with her Learn to Spin kit this evening. Her family is planning a farm visit in the next few weeks! We got a visit from Science Officer Chris, but she had places to go and yarn to buy, and she was quickly off to other buildings to visit some of the other amazing vendors. A sweet surprise - family friends and shareholders Ray and Elizabeth drove over from Austin to check in with the farm booth, and then join us for dinner afterwards. I owe Ray a hat. Can't wait to get back to the spinning wheel to finish that project for this faithful supporter. It's coming Ray, I promise! 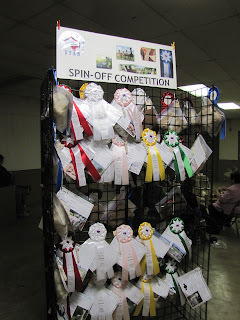 Remember all that luscious alpaca fiber Rita and I spun and judged a couple of weeks ago? Here is the end result - each sample is reunited with its identifying information, photo and ribbons. 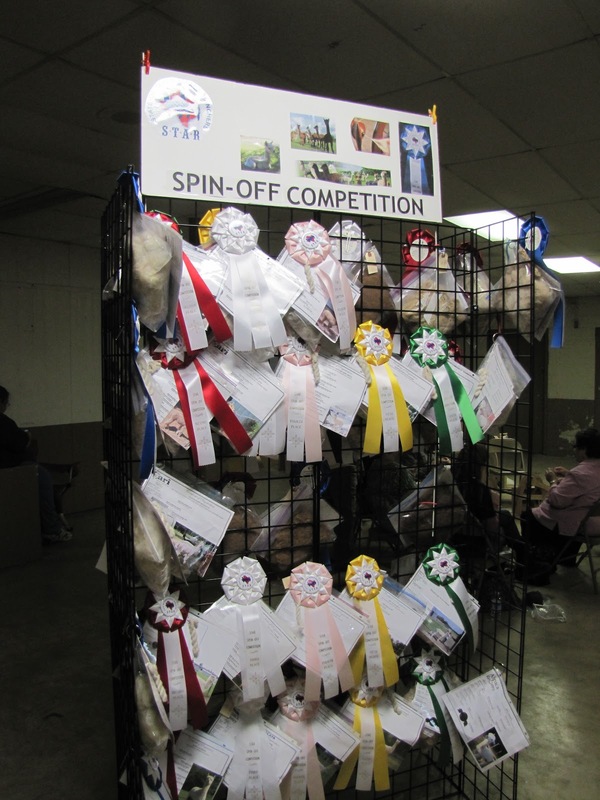 I love seeing the animals that produced the fiber samples, and even meeting some of the happy breeders of these animals who have won ribbons. One hundred eleven samples are displayed at the Kid N Ewe festival for all to enjoy. 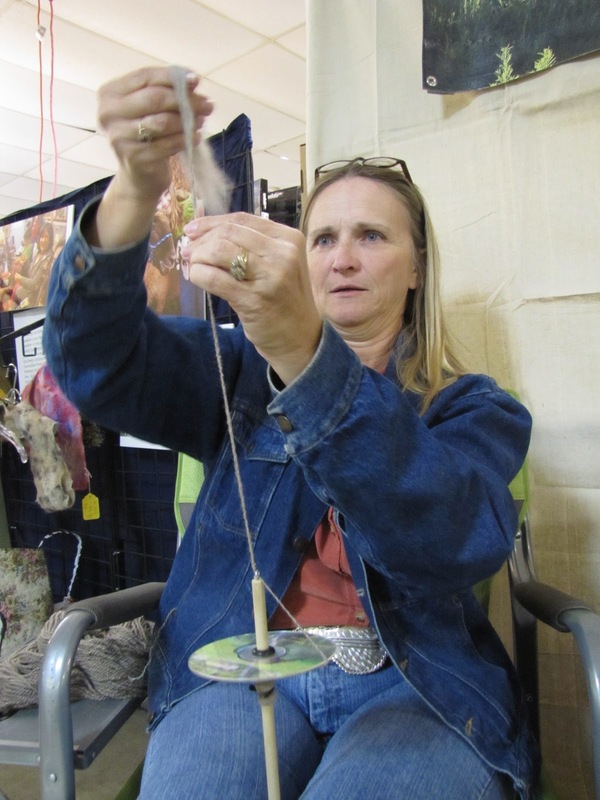 Come touch the sample skeins to see how the fiber feels spun up - finger candy. The festival runs from 9 AM - 3 PM tomorrow. Then we pack it up and come home. I am blessed out of my new alpaca socks to have spent this time with new farm and fiber friends. And I'll be happy to get home and hug all the fuzzy necks. And a fine time was had by all...indeed! Lovely photos and a lot of fun, thanks for this post.